The area of triangle ABC is 40 square feet. The length of the line segment BD is 1/4 of the line segment AB. The length of the line segment EC is 1/3 of the line segment AC. What is the area of triangle ADC? Since the area of triangle ABC is 40 square feet, and triangle ADC is ¾ of triangle ABC. The area of triangle ADC is ¾ of the area of triangle ABC, that is ¾ x 40 = 30. 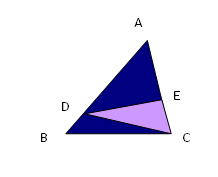 What is the area of the shaded triangle CDE? As we have found in the previous problem, the area of ADC is 30. And since triangle CDE is 1/3 of triangle ADC, the area of CDE is 1/3 of the area of ADC, which is 1/3 x 30 = 10.